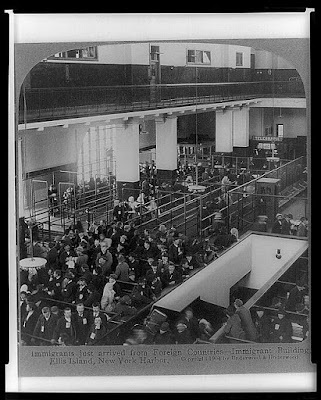 During their crossing, immigrants were required to complete 29 questions upon arrival at Ellis Island. Their answers were scrutinized by the Immigration Inspectors in the Great Hall. Any issue might put an immigrant in front of the dreaded Board of Special Inquiry, who would ultimately decide if they could stay in the US. Imagine your fate being determined in two minutes with an inspector and the following questions. 5. Are you married, single, widowed or divorced? 7. Are you able to read and write? 11. What is the name and address of a relative from your native country? 13. Your number on the immigration list? 14. Do you have a ticket to your final destination? 15. Who paid for your passage? 16. How much money do you have? 17. Have you been to America before? If so when, where and how long? 18. Are you meeting a relative here in America? If so, who and their address? 19. Have you been in a prison, charity almshouse, or insane asylum? 20. Are you a polygamist? 21. Are you an anarchist? 22. Are you coming to America for a job? What and where will you work? 23. What is the condition of your health? 24. Are you deformed or crippled? 26. What is your skin color? 27. What color are your eyes and hair? The key questions the inspectors focused on were purposely scattered throughout – 6, 16 and 22. In other words, would you be able to contribute or will you become a burden on society? Only after all was in order, physical and questionnaire, would they be released. Once cleared, they could grab a hot meal in the Dining Hall, locate their baggage, exchange their currency for dollars, and then be ferried to train stations in New Jersey. Tell me your thoughts and if you can add to my family story! If you enjoy this blog, I'd be very grateful if you'd share with a friend...you never know who may be a potential cousin!